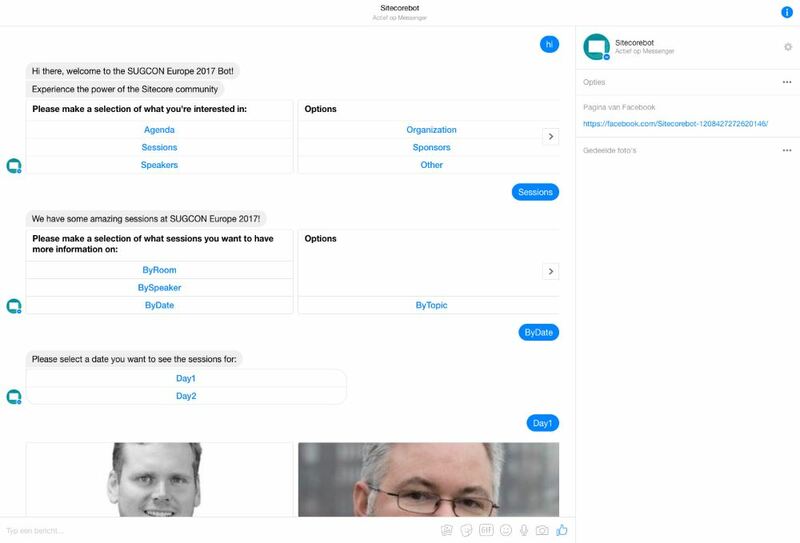 Like mentioned before: since this is an event bot, it’s main purpose is highlighting session info, agenda information, sponsor information etc….During SUGCON Europe 2017 attendees can access the bot through various channels, with their laptops, but also on their mobile devices through widely used apps like Skype and Facebook Messenger. In this blogpost the Facebook Messenger channel will be highlighted. To enable the SUGCON Europe 2017 bot into your Facebook Messenger app, you can go to the following Facebook page: https://www.facebook.com/Sitecorebot-1208427272620146/, where you can chat with the SUGCON Europe 2017 bot or you can go directly to Facebook Messenger at https://www.messenger.com/t/1208427272620146 and start chatting with the SUGCON bot. We know it’s not a perfect bot, but it should do it’s purpose for the event. Go check out the bot in Facebook Messenger, one of the most used chat platforms at them moment, and play with it. During our presentation at SUGCON Europe 2017, we’re going to demo the bot as well in Facebook Messenger, and show how we build it. Besides that we’re also walk you through how you can connect Sitecore to the Bot Framework.